Ever heard of a sandwich so popular, that it’s become an ingredient all by itself? That’s right: the Philly Cheese Steak can also be pizza topping, a potato chip, and even a soup. But let’s explore the real deal, the famous sandwich that is loved (and debated) far and wide by everyone who bites into it. 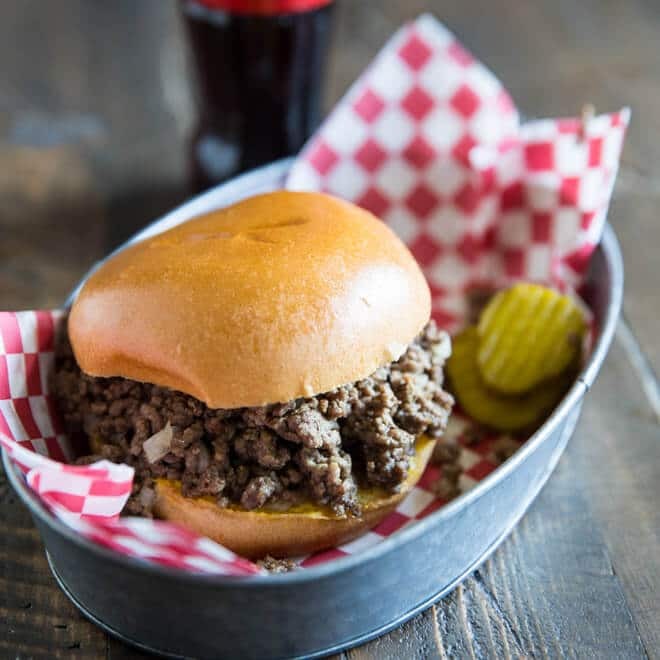 Tender thin beef, onions, and gobs of gooey provolone on a bun that soaks up every last bit of flavor. Nothing could be better than this recipe, in or outside of Philadelphia. What is Philly Cheese Steak? “One provolone with”: one Philly cheese steak with provolone and onions. “One whiz without”: one Philly cheese steak with Cheese-Whiz, no onions. “Two Americans, one with, one without”: two Philly cheese steaks with American cheese, one with onions, one without. Got it? Now you’re fluent in cheese steak! Where is Philly Cheese Steak from? Ironically, it’s likely that the prototype of the Philly cheese steak was invented by a lowly hotdog vendor named Pat Olivieri in the 1930s. In order to make his own lunch one day, he threw some beef and onions on his grill and put it in a bun. (Even hot dog salesmen get tired of hotdogs!) A cab driver smelled the heavenly scent of the sandwich and ordered one himself, and the rest is history. He opened up Pat’s King of Steaks to serve his sandwich to a broader audience. It’s when the sandwich gets cheesy in the 1940s that the big debate starts. One of Pat’s employees claims to have invented the addition of cheese to the sandwich, using provolone. But yet another employee of a rival steak shop, Geno’s Steaks, insists that he was the first to add cheese. This was a long time ago. 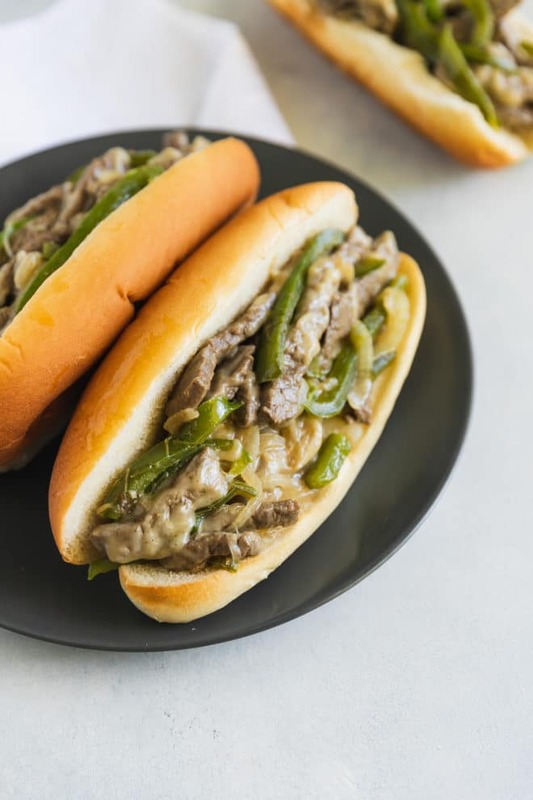 By the time the beloved processed food Cheez-Whiz enters the picture in the 1950s, the steak sandwich had officially become the cheese steak sandwich and Pat’s and Geno’s still duke it out today on the same block in Philadelphia. Diehard cheese steak fans can still eat both, maybe even for the same meal. What are sirloin steak tips? The boneless sirloin tip is a lean and tougher cut of beef, but as it is close to the sirloin section, it is one of the better quality steaks available from the round. We pound it thin so it’s super tender. 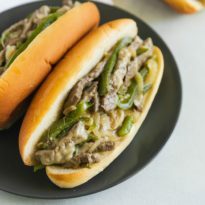 Is this recipe for Philly Cheese Steak authentic? Considering the sandwich’s murky origin story, and all the different ways that people like theirs, I think that this recipe is darn good and as close as it gets. Some people add garlic salt, some people add peppers, some people even add mushrooms. Ultimately it’s your cheese steak, so make it the way you think you’ll enjoy it! What kind of cheese do you use for Philly Cheese Steak? 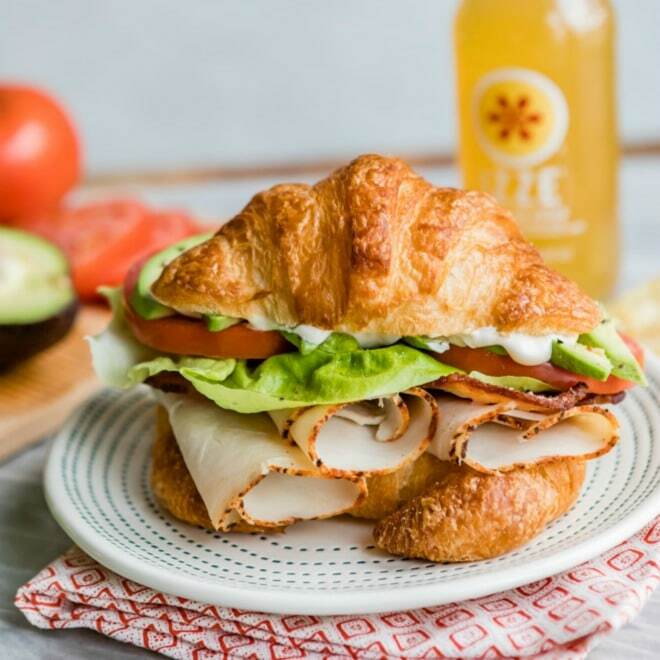 The three basic types that traditionally grace this sandwich are provolone, American cheese, or Cheez-Whiz. It’s all a matter of personal preference. Lucky for me, I like them all. 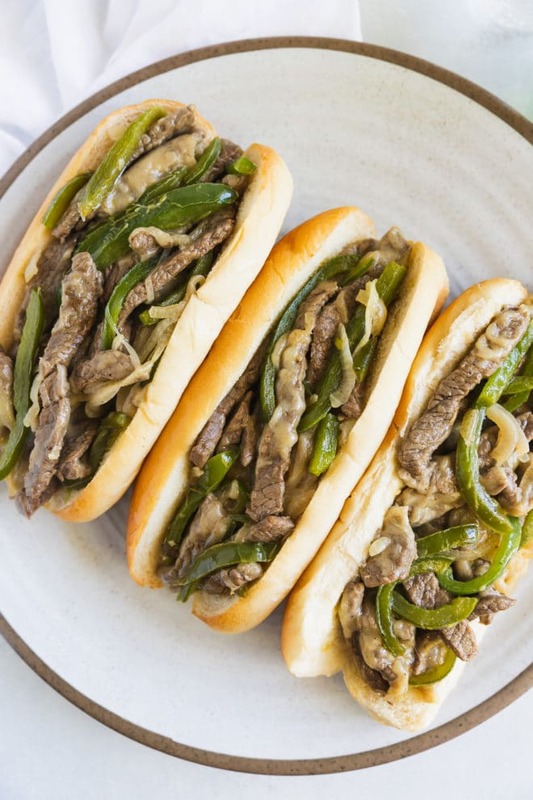 What is the best bread for Philly Cheese Steak? When selecting bread, try to look for a chewy roll like a hoagie. The gold standard is from Amoroso’s Hearth Baked Rolls in Philadelphia. It’s a little crispy on the outside with a soft, slightly chewy inside. 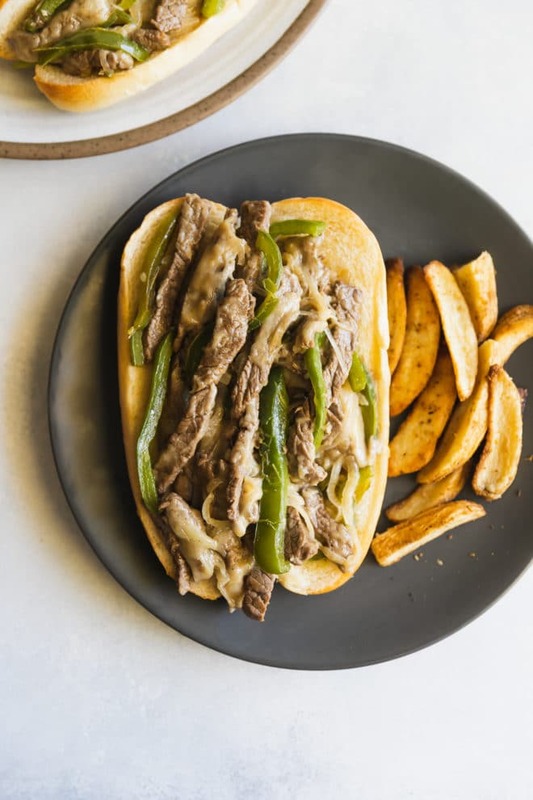 Save this Philly Cheese Steak Recipe to your “Main Dishes” Pinterest board! Ever heard of a sandwich so popular, that it’s become an ingredient all by itself? That’s right: the Philly Cheese Steak can also be pizza topping, a potato chip, and even a soup. But let’s explore the real deal, the famous sandwich that is loved (and debated) far and wide by everyone who bites into it. Tender thin beef, onions, and gobs of gooey provolone on a bun that soaks up every last bit of flavor. Nothing could be better than this recipe, in or outside of Philadelphia. Slice beef with the grain into 1-inch pieces. Arrange in a single layer between two sheets of plastic wrap or wax paper and pound until paper thin. In a large skillet over medium-high heat, heat 2 teaspoons oil until shimmering. Add onions and cook until softened, about 5 minutes. Transfer to small bowl. Add 2 teaspoons to the same skillet and heat over high heat until smoking. 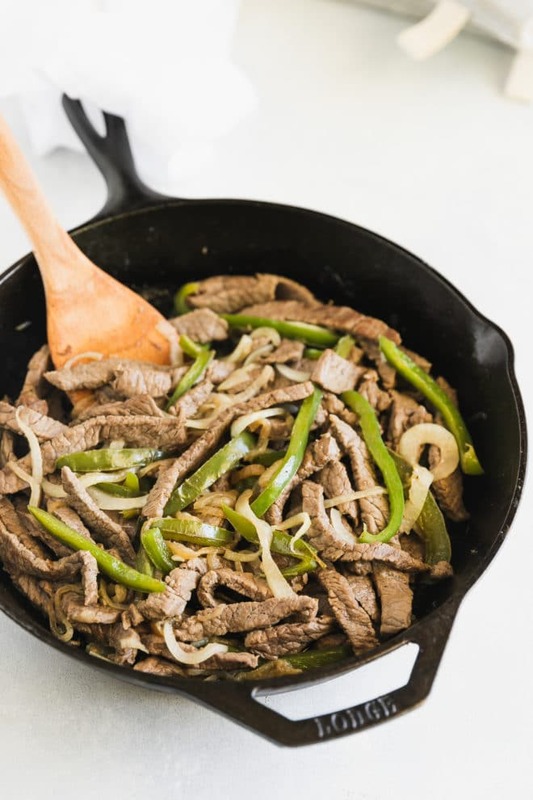 Add half of beef to skillet (slices may overlap), season with salt and pepper, and cook until meat is browned, about 1 minute per side. Remove from heat and layer 8 pieces of provolone over beef. Using spatula, pick up half of beef-provolone mixture. Cover skillet until provolone is melted, about 1 minute. Divide beef-provolone mixture evenly between 2 rolls, evenly distribute half of the onions over sandwiches, and pour any accumulated juices from skillet onto meat. Wrap each sandwich tightly in aluminum foil and set aside. Repeat with remaining 2 teaspoons oil, remaining half of beef, remaining 8 pieces of provolone, remaining 2 rolls, and remaining half of onions. Wrap each sandwich tightly in foul and let sit for about 1 minute. Serve with roasted red peppers if desired. To substitute Cheez Whiz: Omit adding cheese with beef in Step 2. In a small microwave safe bowl, microwave 3/4 cup Cheez Whiz until warmed through, and spoon over assembled sandwiches.